That's In The Bible? | What does the Bible really say about a variety of topics, such as do angels really have wings? etc. What does it mean to worship God? Does it mean going to church? Does it mean singing songs and hymns? What does God expect from us and how does he want us to worship Him? Are you truly worshipping God, the Bible way? You might be surprised at this look at worship as we see what the Bible says about how to worship God. The subject of worship is a prominent subject in both the Bible and the NT church. Considering all the forms of the word, worship shows up 198 times in the Bible. The first time it shows up is in the book of Genesis (the 1st book in the Bible), and the last time it shows up is in the book of Revelation (the last book in the Bible). And, coincidentally, the first time it shows up is in Gen. ch. 22, while the last time it shows up is in Rev. ch. 22. And that last reference leaves humanity with their marching order from the Lord, as it says …worship God. While He was on earth, the Lord Jesus Christ was worshipped… And He was worshipped on this earth both before His death, and after His resurrection. There is no getting around it, you are going to be either a fool in God’s eyes, or you are going to be a fool in the world’s eyes. Which you choose to be will affect everything that you do. So let’s see what the God has to say about the fool. I certainly don’t want to be in the category or possess the qualities of traits that God identifies as those belonging to a fool, do you? Once those traits are identified and knowing what they are you can take steps to make sure you are not accounted for as a fool in God’s eyes. And then we will look to see what the world counts as a fool. Is all music good music? Is rock music good music? Is rap music good music? Is classical music good music? Surely country music must be good? If you like the music you listen to it must be good music, right? Is there even such a thing as good or bad music? Could the music that you are listening to be affecting you? Some people will not listen to this episode today because they do not want to know the answer to these questions. You have a choice! Ignore this topic or find out what the Bible says about music. 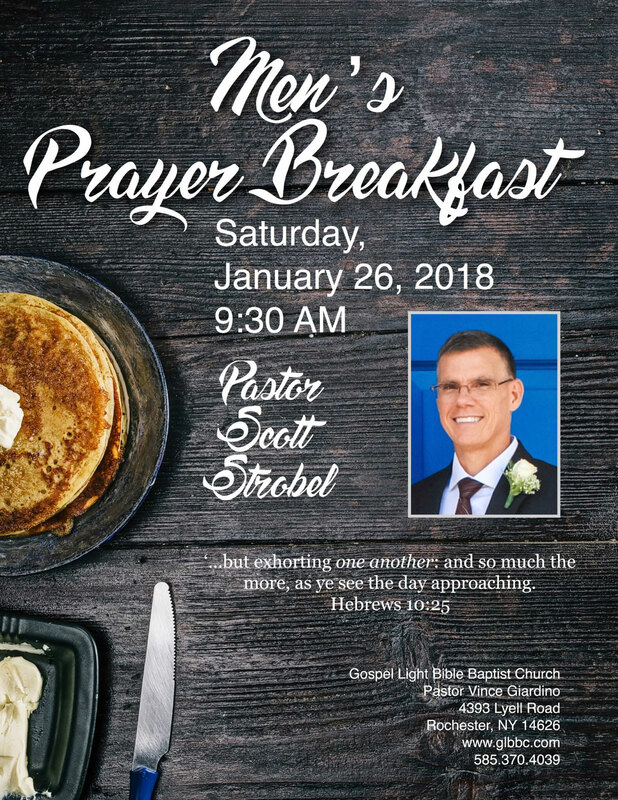 Flyer on Men’s Prayer Breakfast, Saturday, January 26, 2018 9:30AM in Rochester NY with Pastor Scott Strobel. (As mentioned in today’s podcast). Music: God’s Gift or Satan’s Tool? • Is God for or against music? • (Job 38:1-7) Music is a very powerful tool, there is no doubt about it. Music has a history upon this Earth even right at the very beginning when God was creating the Earth. Here are the angels (the morning stars) which are angels (Revelation 1:20) and they “sang together”. • (Ezekiel 28:12-15) Here is the devil when he was created, and he was created perfect (vs. 15). And we are told that God created him with “Tabrets” (percussion instruments) and “Pipes” (wind instruments). So God intended from the beginning for music to be created on this Earth. • (Revelation 5:8-10), (14:1-3) God also has music in Heaven, so we see that God is for music, that God has nothing wrong with good godly music. 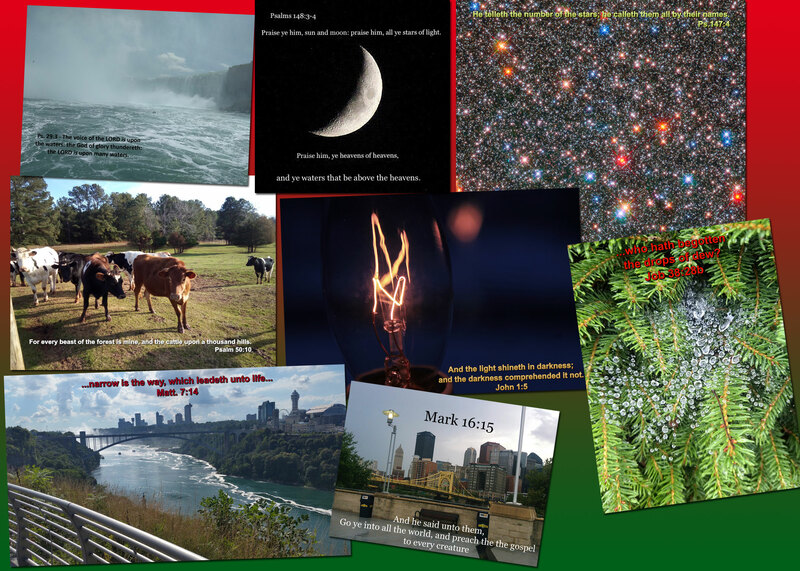 • For what purpose did God Create Musical Beings? • (Revelation 4:11) God created everything ultimately for His pleasure. So God created the Angels, lucifer, and human beings as musical beings to bring Him pleasure. Too much of this world is focused on trying to find music to listen to or to even create themselves that pleases them rather than focusing on it actually pleasing God. Today’s study is on the topic of discipleship. What exactly does it mean to be discipled? Should you disciple someone else? Should you be discipled? Follow along with us as we discover the importance of discipleship and how it can energize your Christian walk with the Lord. Does the Bible clearly state that Jesus Christ was God? Did others in the Bible state that Jesus was God? Does Jesus Himself ever claim or take the title of God? Is there more than one God? What about the Trinity, what does that mean? Find out the clear answers to these questions in this episode of “That’s In The Bible?”. B i b l e B a p t i s t B u l l e t i n – Call The Bible Baptist Bookstore at (850)477-8812 to order a paper copy subscription or download digital copies from the past year. E v a n g e l i s t S a m u e l C. G i p p, Th. D. – Visit Dr. Gipps website here. It is also one of the most important subjects of the entire Bible, and that subject is, The Deity of Christ. Some also refer to this subject as the divinity of Christ… In either case, it means that Jesus Christ is God. So let me boldly and unashamedly proclaim that right at the outset, that indeed, Jesus Christ is God! Having made that claim, I will take you on a tour of several verses in the Bible that make or support that same proclamation. Because the truth of this matter is really not contingent upon what I think, or what you think, or what somebody else thinks… The truth of this and all theological matters are contingent upon, what saith the Scriptures? And as we will see right from the very beginning, the Scriptures are clear in their position on this matter, that Jesus Christ is God.